The transuranium elements (TRU) neptunium, plutonium, americium, and curium dominate the long-term radiotoxicity and heat load of used nuclear fuel. Therefore, innovative nuclear fuel cycles which involve a separation and recycling of these elements are under development in many countries. An essential part of these processes is the separation of trivalent actinide (An(III)) and lanthanide (Ln(III)) ions. This separation is a great challenge due to the similar chemical properties and ionic radii of these element groups, rendering high demands on the selectivity of the extraction ligands. Heterocyclic chelating ligands of the BTP and BTBP type belong to the most promising nitrogen donor extracting agents for the An(III)-Ln(III) separation so far. They are able to directly extract trivalent actinides from solutions containing up to molar concentrations of nitric acid with separation factors between 100 and 300. This is an important requirement as reprocessing strategies for used nuclear fuel involve nitric acid aqueous phases. During the last ten years a good amount of work has been carried out to understand the unique properties of BTP and BTBP. This is important because more than 30 years of research and development have not offered the “perfect” nitrogen donor separating agent. Therefore, the search for better compounds continues (for further information, see: P. J. Panak and A. Geist, Chem Rev, 2013, 113, 1199-1236.). Molecular structure of 2,6-bis(5,6-dialkyl-1,2,4-triazin-3-yl)pyridines (BTPs, top) and 6,6’-bis(5,6-dialkyl-1,2,4-triazin-3-yl)-2,2’-bipyridines (BTBPs, bottom). As the presently internationally discussed N-donor extraction ligands for the An(III)/Ln(III) separation do not fulfill all the demands for technical application. Therefore, extraction ligands with potentially improved qualities are designed, synthesized, and characterized. Spectroscopic methods, such as time-resolved laser fluorescence spectroscopy (TRLFS) and X-ray absorption spectroscopy (XAS) provide important information on the complexation properties of the ligands and coordination structures of the formed An(III)/Ln(III) complexes. As fundamental understanding of the molecular reason for the selectivity of N-donor ligands is crucial for the development of new compounds with improved properties, several detailed studies on the complexation properties of BTP and BTBP type ligands with a slightly modified BTP skeleton are performed. Aim of this work is to identify trends in complex stability, selectivity, and extraction performance by a systematic variation of the structure of N-donor ligands. We carry out investigations on the structure and speciation of actinide-and lanthanide complexes in solution. The experimental program primarily involves EXAFS, TRLFS and NMR investigations, supported by quantum-chemical calculations. 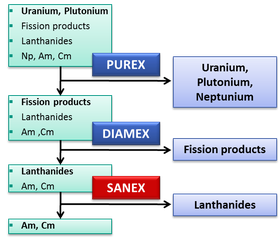 In recent years the international research in the partition field focuses more and more on the development of innovative extraction strategies, such as GANEX, i-SANEX, 1c-SANEX, EXAM, and AmSel processes. These innovative extraction processes aim at simplifying the process scheme (the currently discussed partitioning process consists of three sequent extraction steps) or at an efficient separation of Am(III) from Cm(III). The latter is of particular interest as the recycling of minor actinides as nuclear fuel is complicated by the presence of curium due to its short term thermal power and neutron dose rate. In this context we perform fundamental research on water soluble BTP and BTBP ligands to study their extraction and complexation behavior towards Ln(III) and An(III).